"Photo Discoveries makes it easy for you to add photographs to people in your family tree who currently do not have any photos, in just a few clicks, based on the work of other users. Many of us cherish the emotional moment when we see for the first time a photograph of our ancestor or relative whom we’ve never seen before. 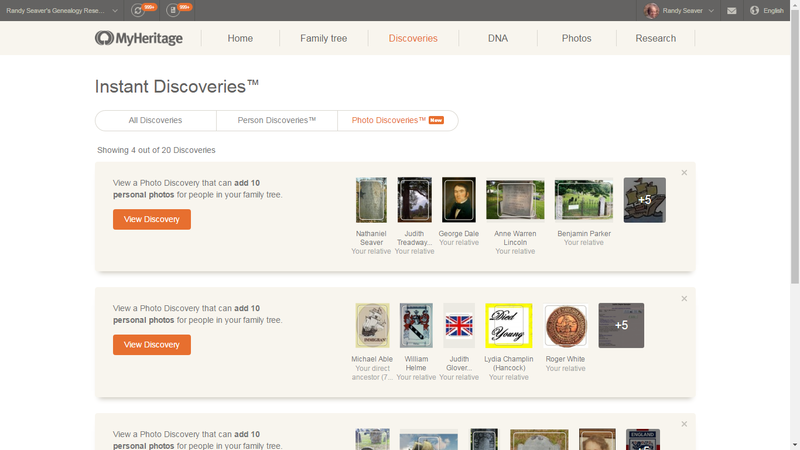 Photo Discoveries can make those special moments happen for you too! Even experienced genealogists are in for a treat." 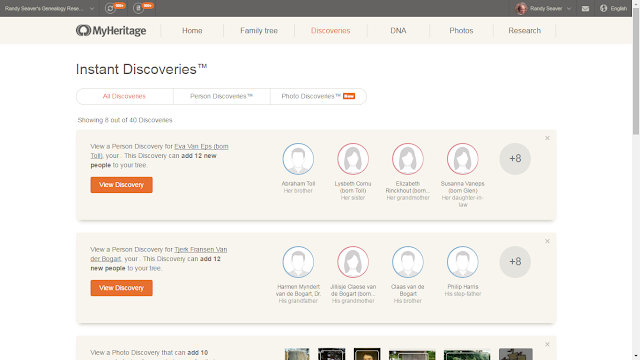 There are three tabs at the top of the screen - "All Discoveries," "Person Discoveries," and "Photo Discoveries" (with a "New" tag). There were several groups of 10 "Photo Discoveries" on the screen above. These "Photo Discoveries" are from a number of other MyHeritage family trees. The 10 Discoveries were on one page. On the left side of the page is information about persons in my MyHeritage tree. 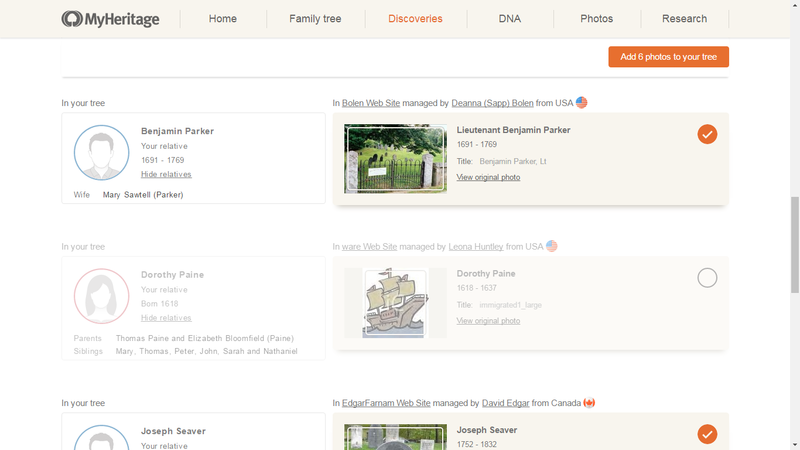 I could click on the "Show relatives" link to see more information about the persons in my tree. Each "Photo Discovery" on the right side of the page has an orange check mark on it. If I leave the check mark orange, then I will be able to add it to my MyHeritage tree. 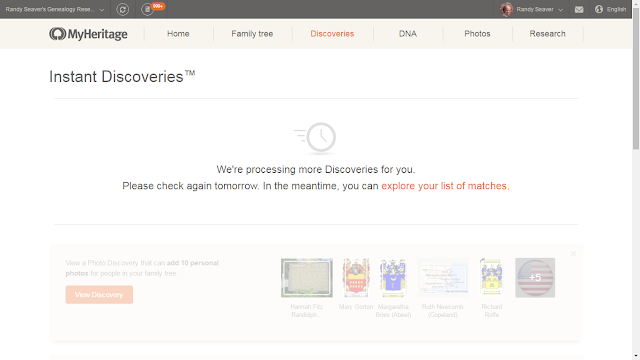 If I uncheck the orange check mark, then the Photo Discovery will not be added to my tree. I decided that I would add actual photographs of persons, or gravestones, etc. to my tree, but not symbols (like crests, ships, or generic images). Note that the middle item on the screen above is unchecked. My "Photos" tab opened, and the first six photos on the list of 105 media items are from the Photo Discoveries. Apparently, this photo was added to three persons in my tree since it was linked to the three persons in the other MyHeritage family tree that had the photo initially. I can click on the buttons above the photo to see a "Slideshow" of photos, "View full size," or "Download" the photo. 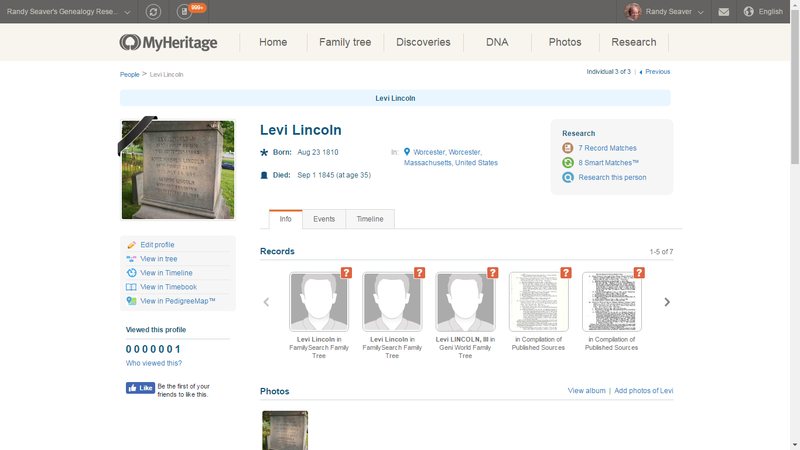 The photo was attached to Levi Lincoln's profile in my MyHeritage tree, and was also attached to the other two persons named in the photo. The page says "We're processing more Discoveries for you. Please check again tomorrow. In the meantime, you can explore your list of matches." 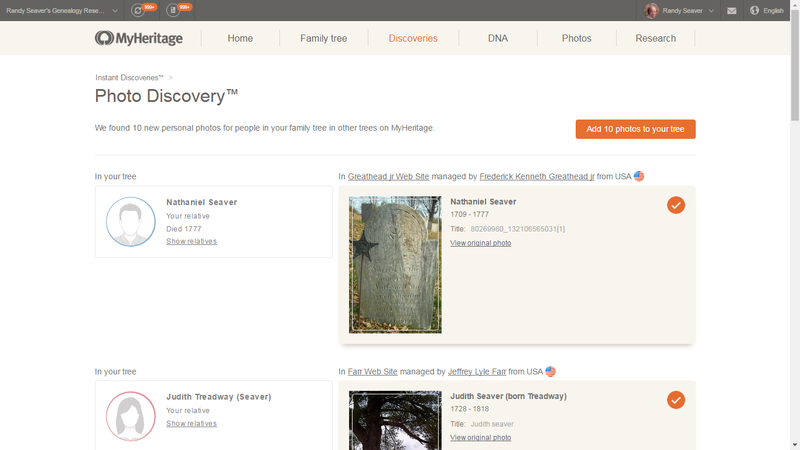 "If you have a PremiumPlus or Complete subscription, you’ll be able to add one Photo Discovery per day. After adding a discovery, we will re-calculate discoveries for you and you will be able to come back the next day and add more." 10) Well, that explains it, but it's frustrating. It won't let me do more than 10 at a time. I will have to come back at another time. 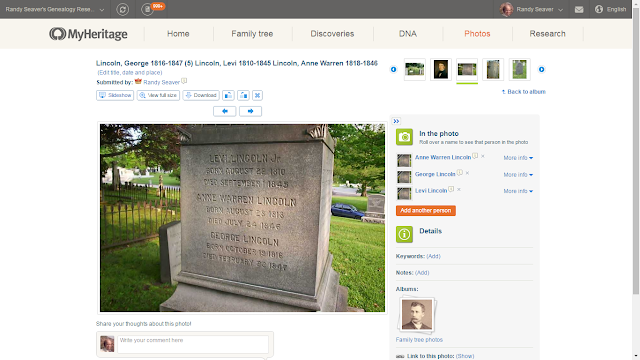 None of the 6 photos that I added to my tree were for one of my ancestors. I wonder if one of my cousins has added a photo for one of my ancestors. 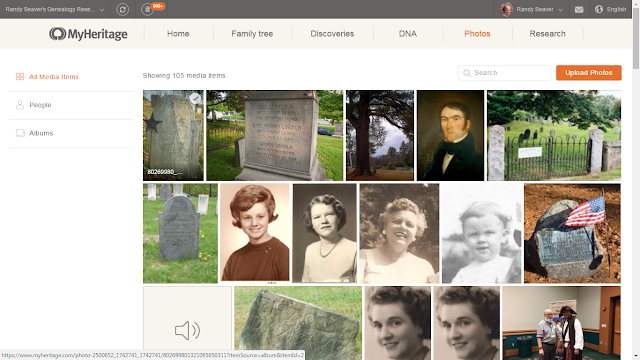 I may go through some of my families in my MyHeritage trees and add more photos so that they may benefit other researchers. 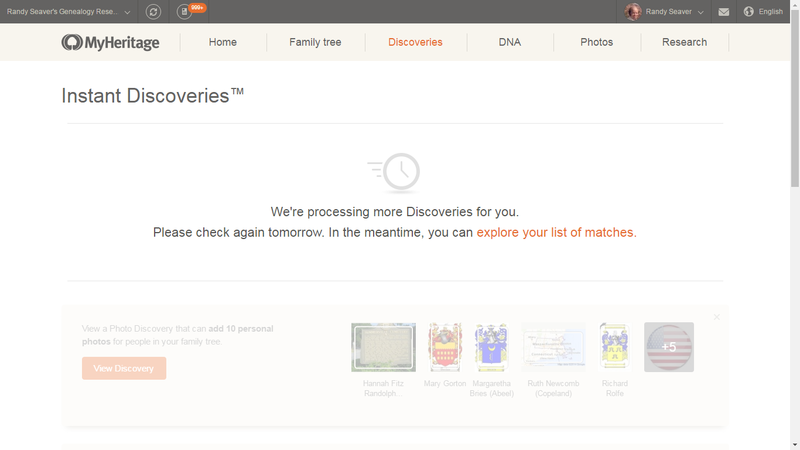 I've also been frustrated by only being able to use the Instant Discovery process only once during 24 hours. Apparently, this is the case each time - regardless if you add photos or people from the Instant Discovery application. I've tried doing both, and each time I click on just one addition (photos, people, information, etc. ), after I've added the information, I'm "locked out" for 24 hours. This is very, very frustrating and I believe it should be changed for premium members (which I am) so that I can access and add as much information as I wish - at any time I wish to add it. 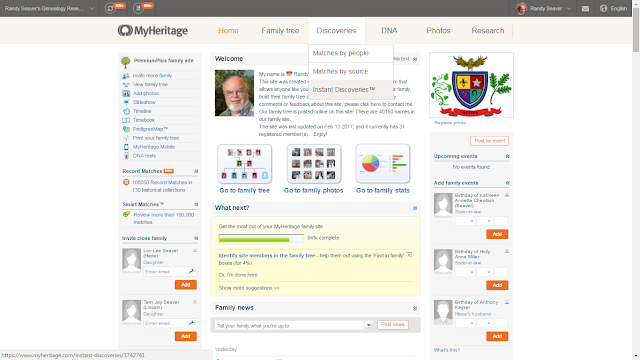 Thanks so much for your article and allowing me to also comment about a common source of frustration with this new process on MyHeritage.